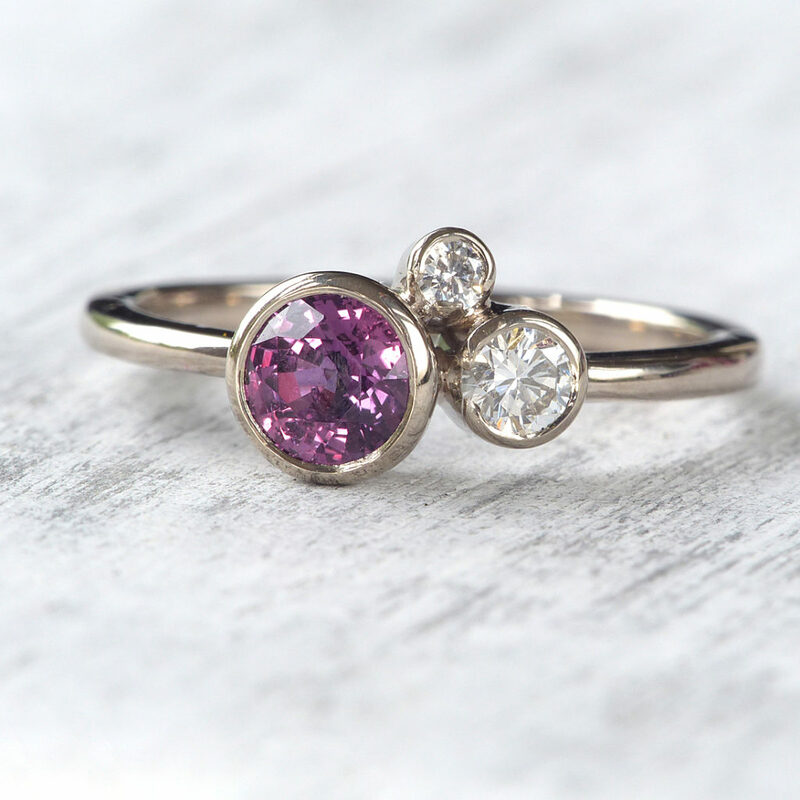 Have you always wanted to make your own jewellery but don't have the skills or knowledge? Dream of owning something that's exclusively yours and no one else's? 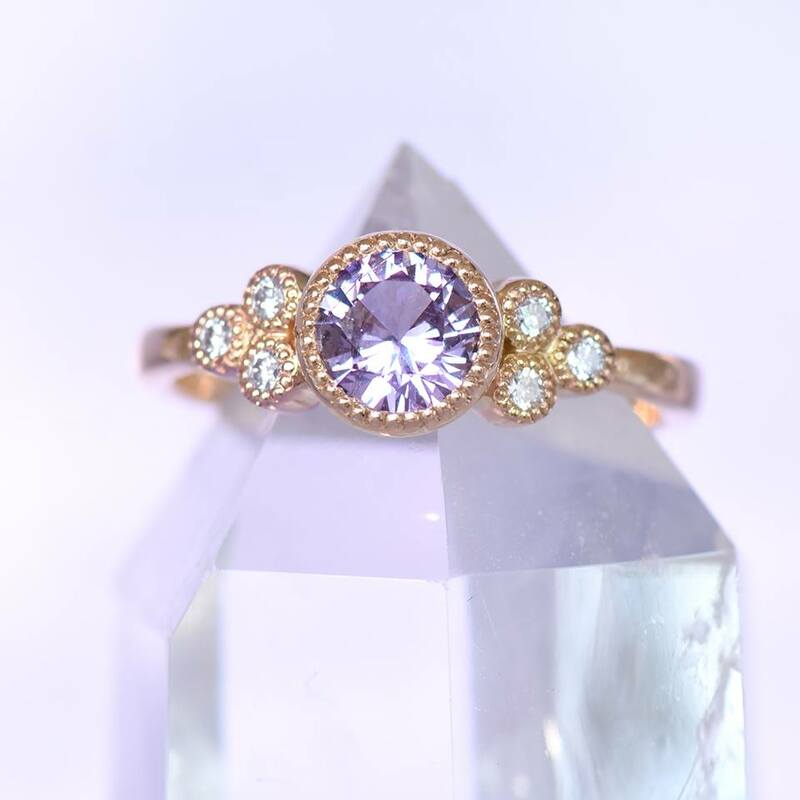 Maybe you'd like a one of a kind engagement ring or bespoke wedding rings that are completely unique? 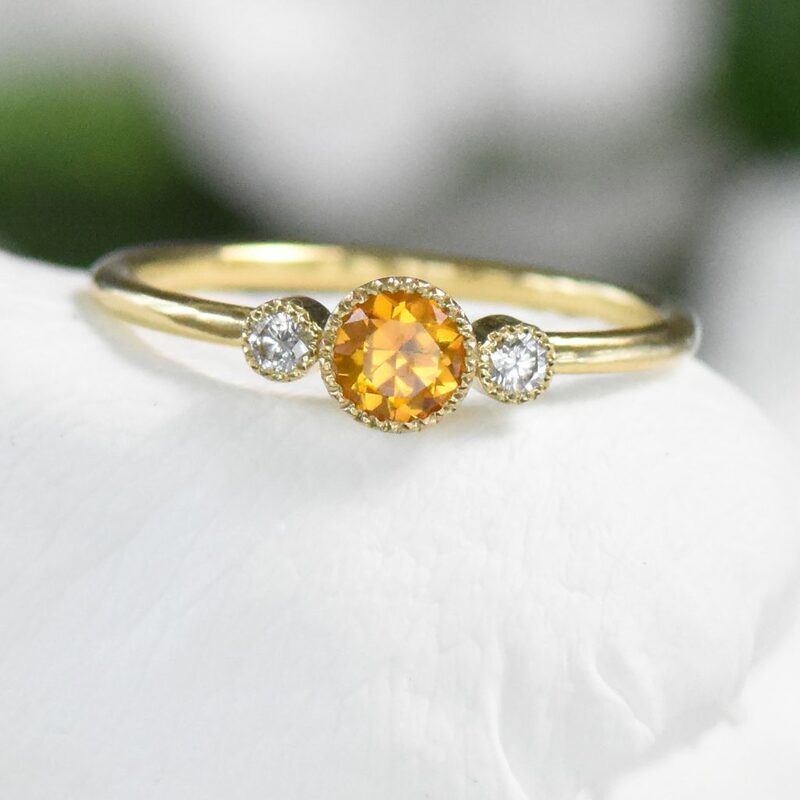 My jewellery design service allows you to create your own jewellery designs in different golds, silver or platinum, set with fairtrade diamonds and other ethical gemstones. It's easy to design your own jewellery, you don't need to be an expert artist or a jewellery specialist. In this guide, I'll help you understand what's possible for your design and explain how I'll work with your ideas to create completely unique rings, necklaces, bracelets, earrings and other pieces. Designing your own jewellery with me is easier than you think. If I need more information than you give me, I'll ask you questions to make sure I fully understand the design you envision. Before I start work, I'll work on creating the design and you can make amendments until it's just right. 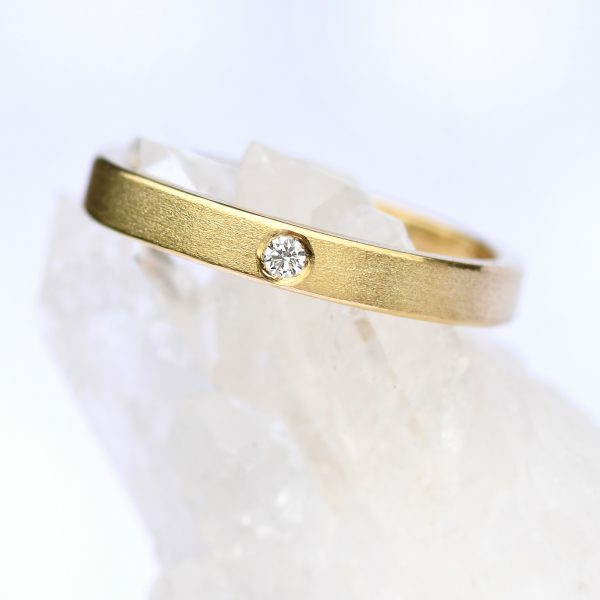 When you commission a bespoke piece of jewellery, I'll take an initial deposit to secure the order. I'll then begin working on your piece. If you'd like the option to pay in instalments, let me know! I can arrange to take payment over the course of a few months to make your custom order easier to budget for. Once the final payment has been received, your new jewellery will be dispatched. Deposits are non-refundable as they are taken to cover the cost of the materials used for the jewellery. Sterling silver is the softest of all precious metals and that means it can be restrictive when it comes to designing silver jewellery. The best silver jewellery features larger amounts of metal than most gold or platinum jewellery, helping to ensure that the jewellery is better able to withstand everyday wear. It's possible to create a variety of silver rings, necklaces, bracelets and other jewellery but it's safer to opt for chunkier, wider and more durable jewellery styles such as statement necklaces and rings. Sterling silver is suitable for most wedding ring designs and I offer a variety of Sterling silver wedding bands in my shop. 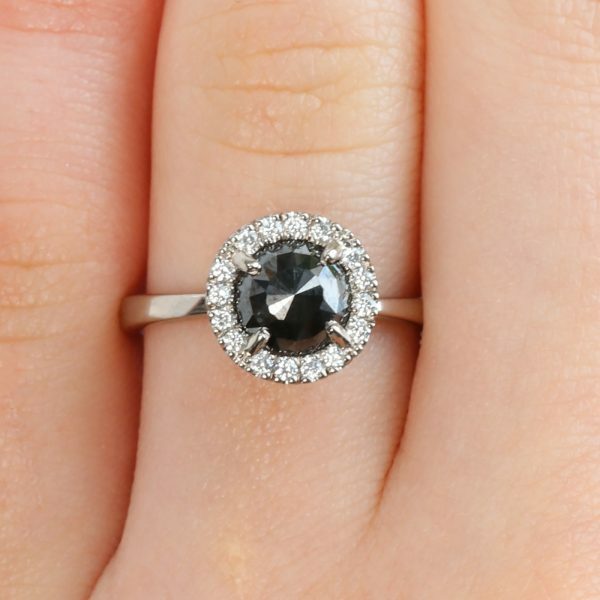 For engagement rings, it's usually better to use white gold as more decorative gemstone settings can be too delicate to make in silver. 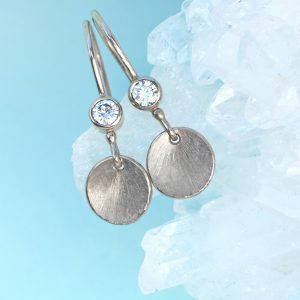 I use recycled 925 Sterling silver in all of my silver jewelry designs. It is exactly the same quality as mined silver but is better for the environment. All of my silver is hallmarked by the Birmingham Assay Office. Platinum and gold are my favourite metals to use for bespoke jewellery designs because they're hard wearing and are easier to maintain than silver. 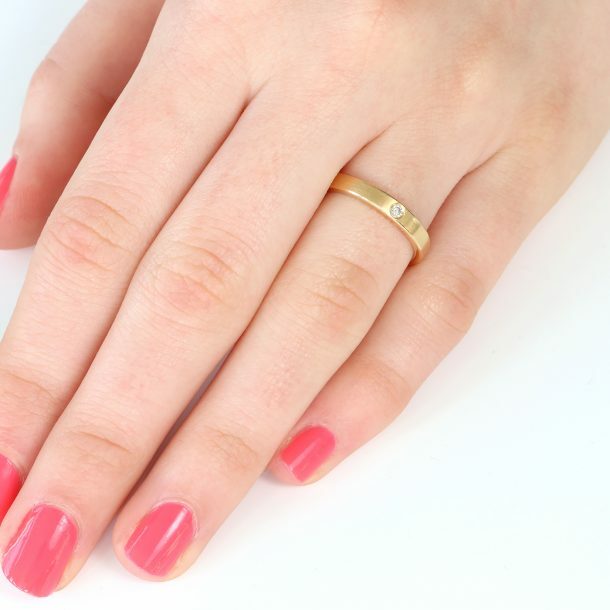 Creating your own jewellery is an investment in time, style and money - so it pays to use these harder-wearing metals to ensure your new jewellery can be enjoyed for many years to come, and even become a future heirloom! I use recycled 18ct gold, white gold and rose gold for my gold jewellery, and reclaimed 950 platinum for my platinum designs. 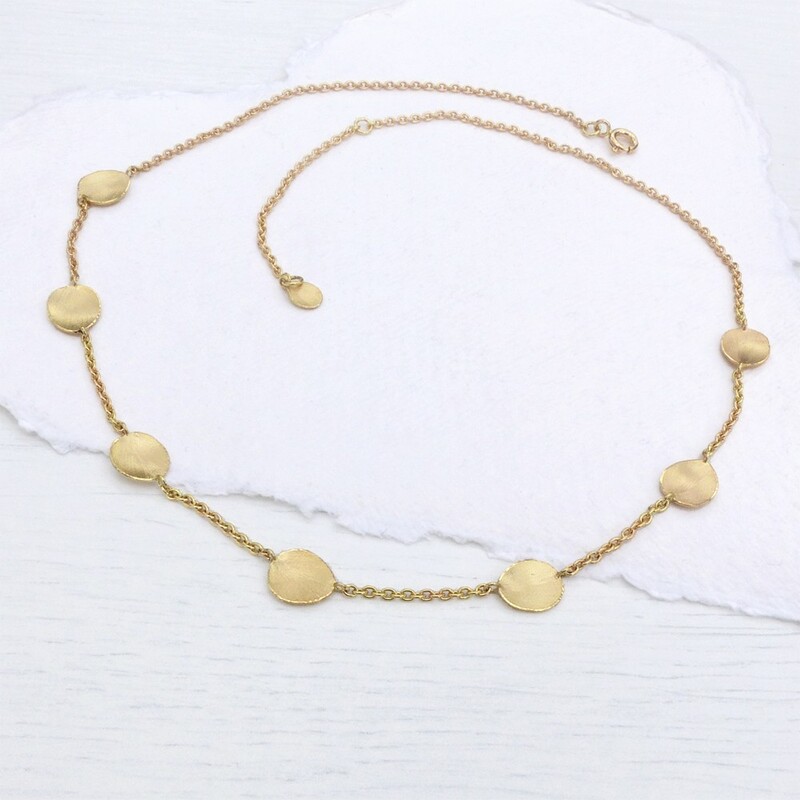 Recycled gold is exactly the same quality and price as mined gold but is kinder to the environment, which is why I don't use any mined gold in my jewellery making. 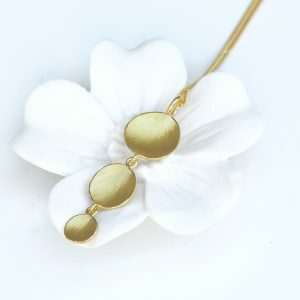 All of my gold and platinum jewellery is hallmarked by the Birmingham Assay Office for provenance. If you need more information about the different styles of precious metal, their prices and their advantages - let me know. I'm always happy to explain the design process to help you understand why it might be better to use one type of metal instead of another. 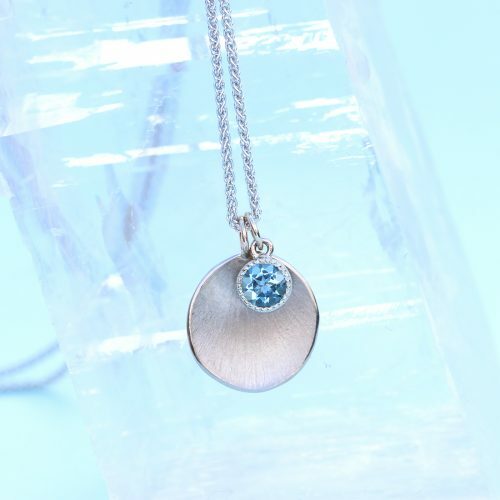 A pendant is a type of necklace that is more practical for everyday wear. These petite pieces of jewellery are designed to be worn on a chain and can be crafted in a plethora of ways. 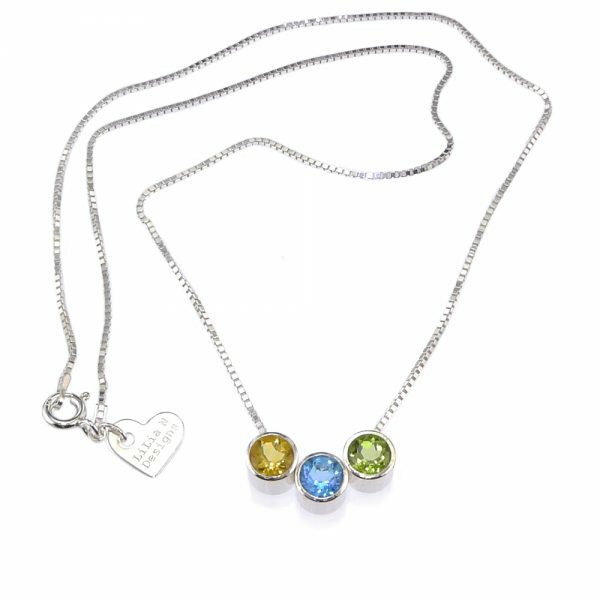 There are a variety of different chain types you can choose to wear with pendants. I usually use dainty spiga chains but if you have another preference, let me know. You don't need to include a chain with a pendant design. One of my favourite things about chains is that they can be mixed and matched with different pendants to create different looks. If you already have chains you can use, ask me for just a pendant design. 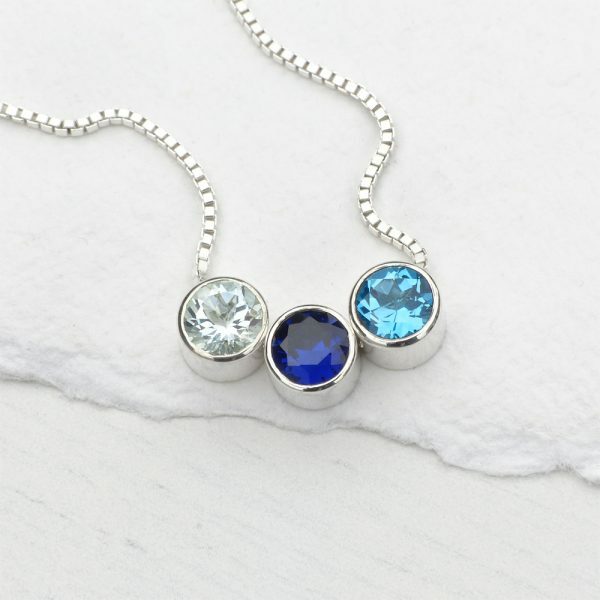 Pendants also look great when layered, wear 16", 18" and 20" chains together to create an easily customised necklace set with different pendants that complement one another. Necklaces are more elaborate than pendants and they tend to incorporate design elements into any chain fastening. 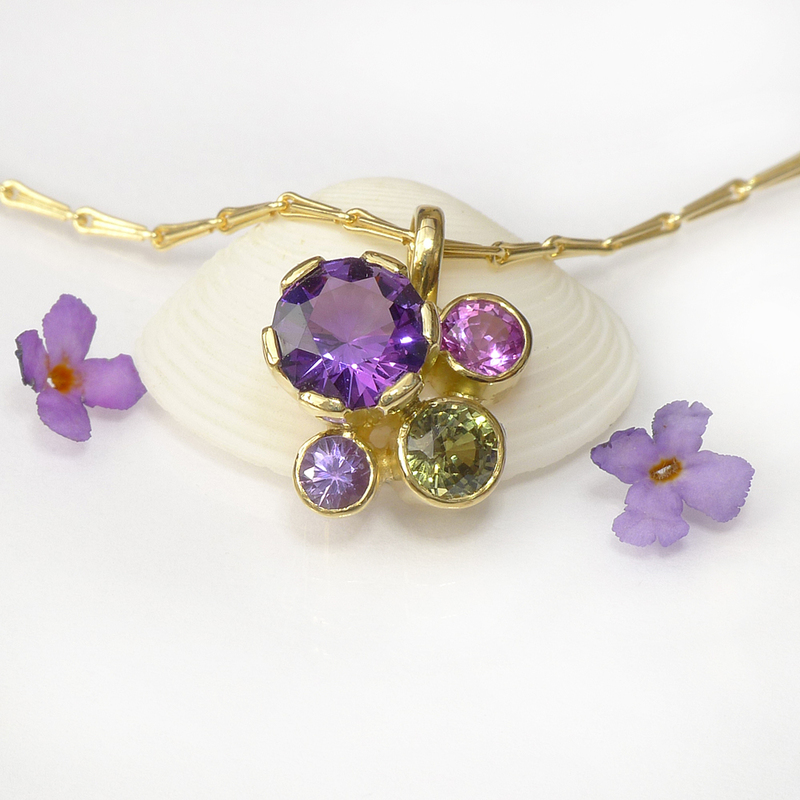 My signature Petals necklace has been adapted to include various different gemstones including amethyst droplet beads and diamond stud detail. 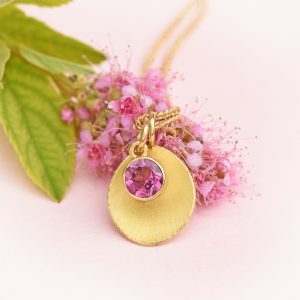 You could design a similar necklace with gemstones instead of petals, or choose something completely different. You can have more or less detail, add more chains or only use chain for the fastening - the choice is entirely yours. 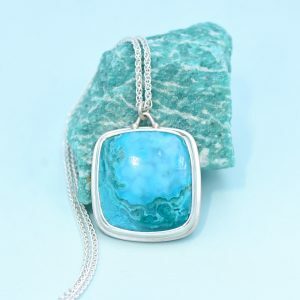 Statement necklaces can include large, natural gemstones as they are designed to carry more weight. 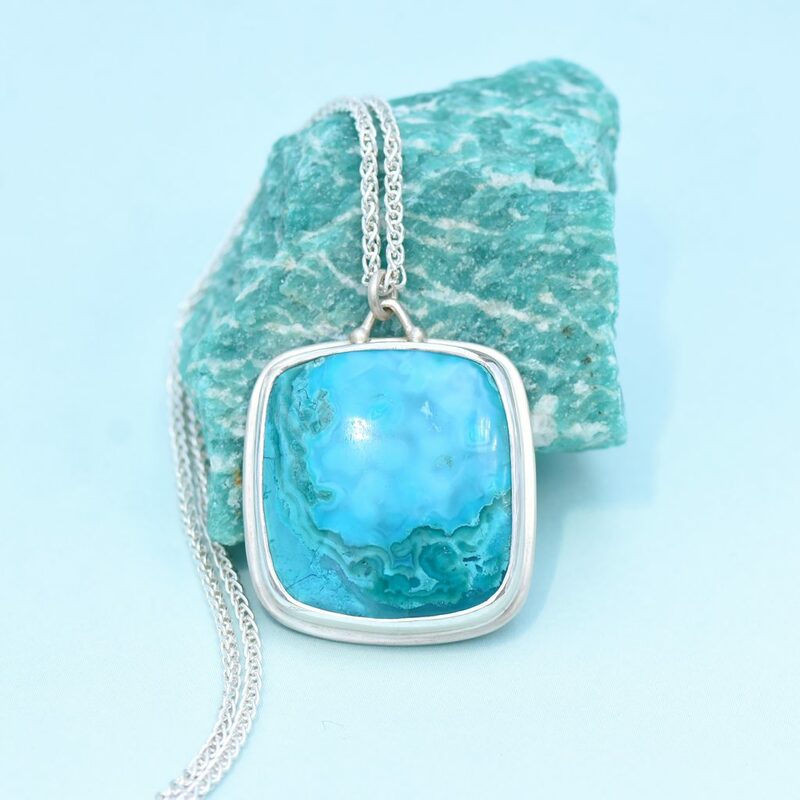 If you love stones like natural turquoise and want the most dramatic stones, you'll need to opt for a necklace over a pendant. 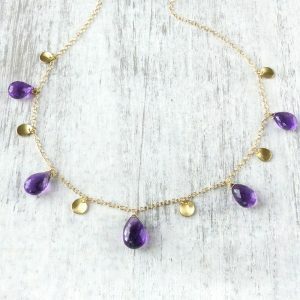 When designing a necklace, let me know how low you'd like it to hang, where the design elements should be focused and if you want any particular type or colour of gemstones included. For everyday wear, stud earrings are the perfect choice. 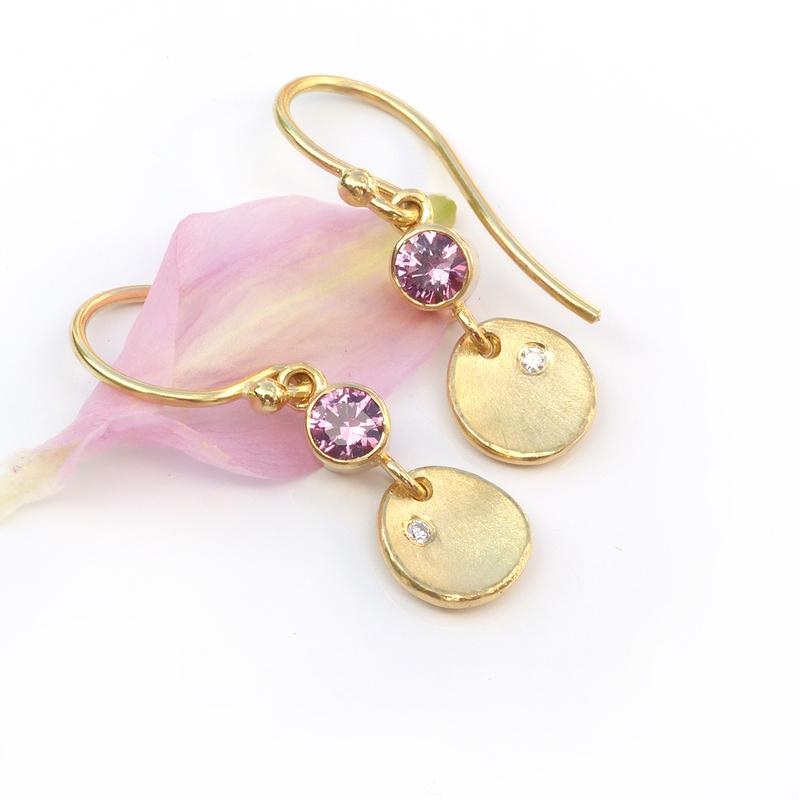 These petite earrings sit relatively flat against the earlobes and don't dangle down like other types of earrings. 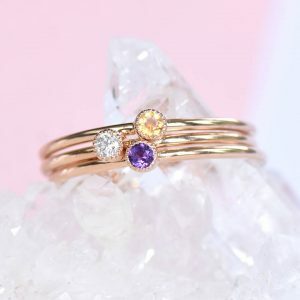 Hoop earrings can either be a continuous ring of gold or a broken ring, with removable decorations often threaded onto the hoop for changeable look. Drop hook earrings dangle below the ear lobe and are used to create more of a statement than studs. These dangling earrings can be as long or as short in length as you like, with the option to add any kind of decoration or gemstones. Earrings can be as dainty or as elaborate as your heart desires. If your design sounds like it will be too heavy for your ears to comfortably wear, I'll let you know! I want you to love your new jewellery, so I'm happy to guide you with similar ideas that will be less heavy. 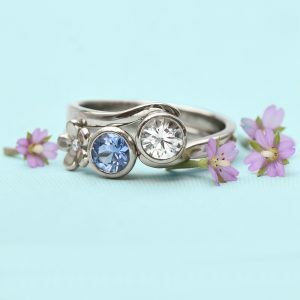 Rings are the most difficult type of jewellery to design because there are so many different options to choose from. 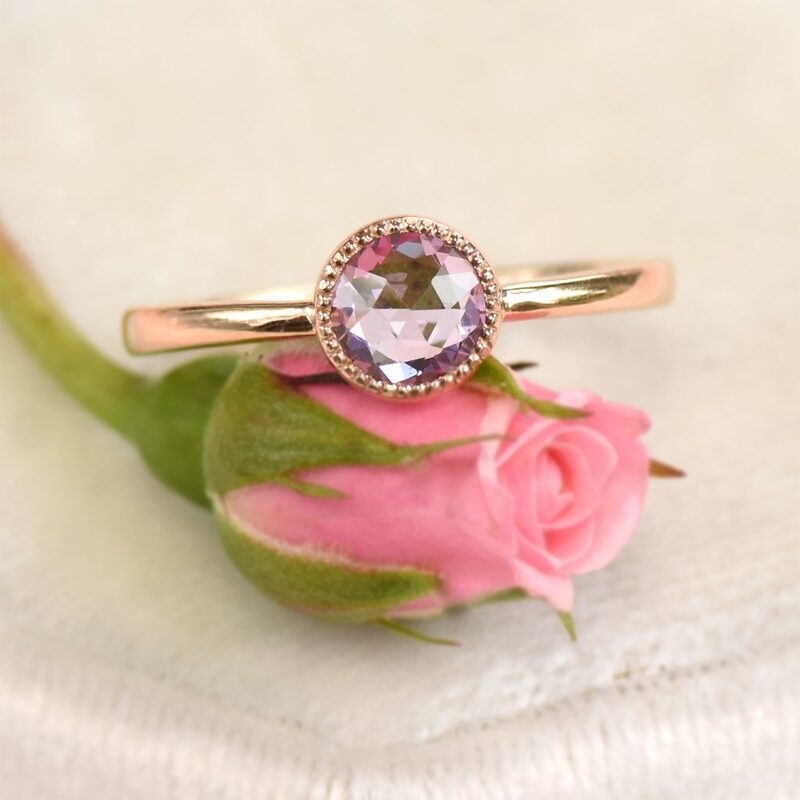 Every element from the band width and shape to the setting style, gemstone shape and style, metal polish and other fine details like engraving can be specified. That's a lot of choice! 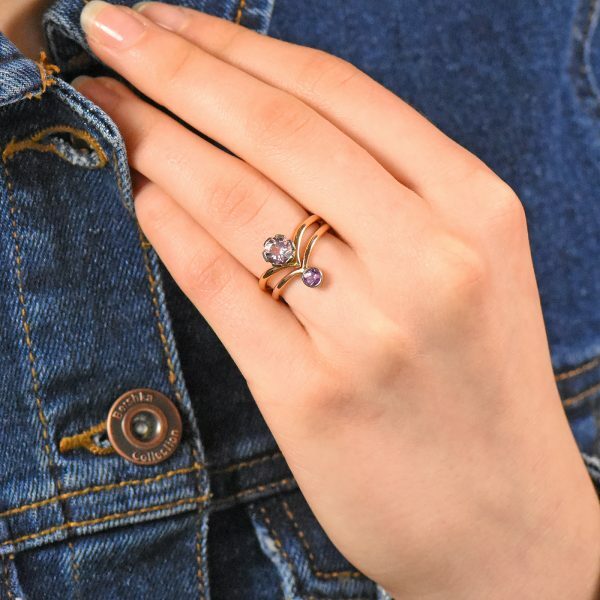 Ring design has some restrictions like earrings, depending on the number of stones you want, the thickness of the ring, the metal type and the kinds of design features and gemstones you want to use. 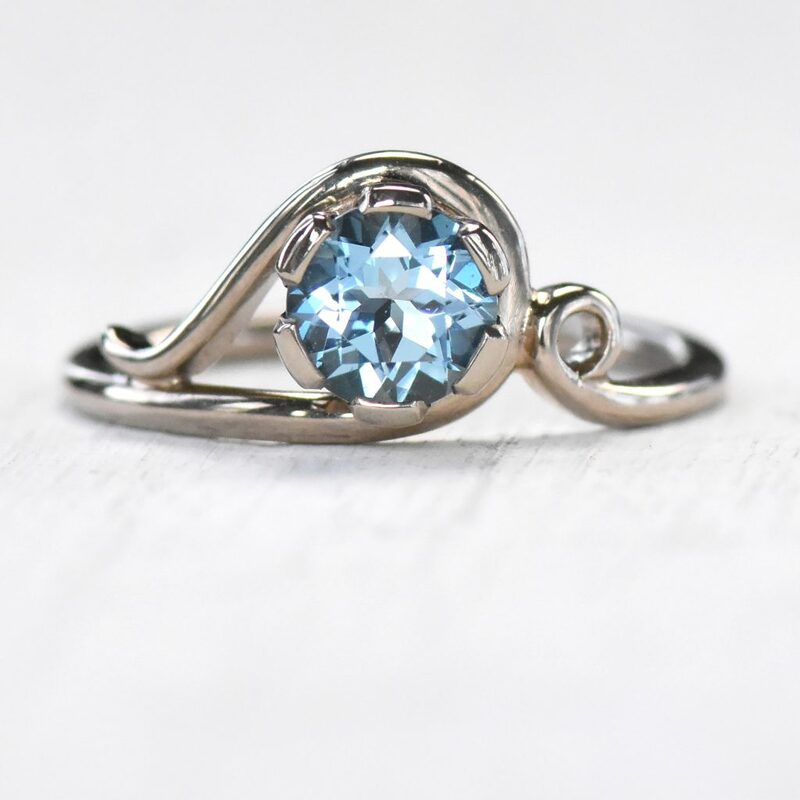 Before you start designing a ring, you should read my Bespoke Ring Guide which has lots of useful information about different styles of ring. Design a single dress ring, stacking ring set, interlocking wedding ring & engagement ring set or any other type of ring your heart desires. 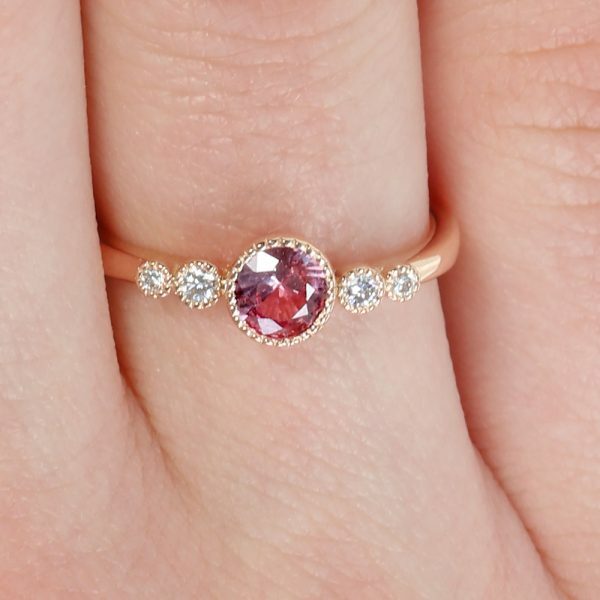 Looking for an engagement ring? Head over to my Engagement Ring enquiry page. 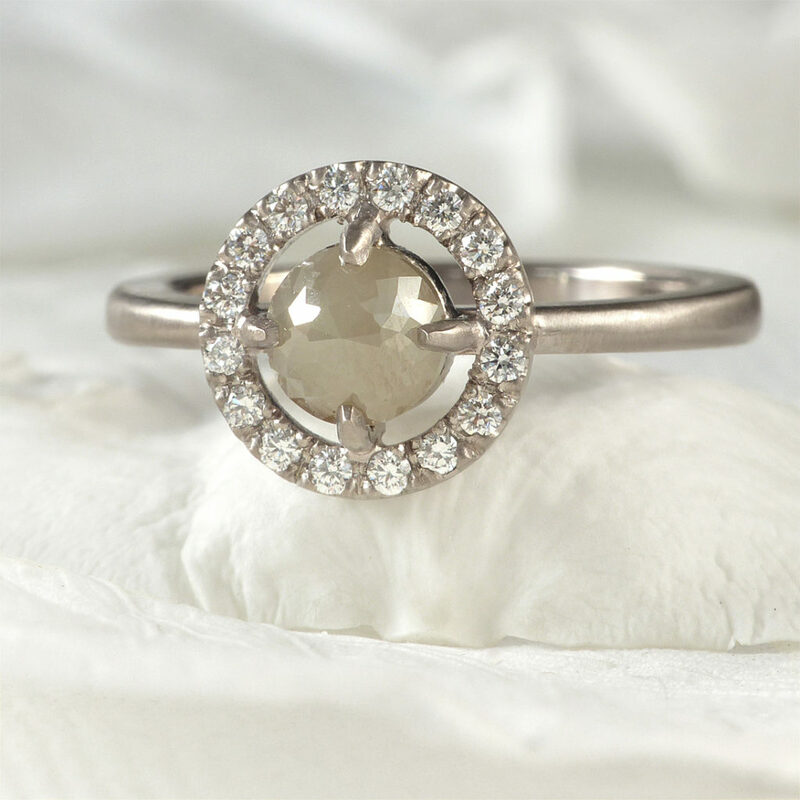 Adding sparkle to your jewellery is easy with gemstones. 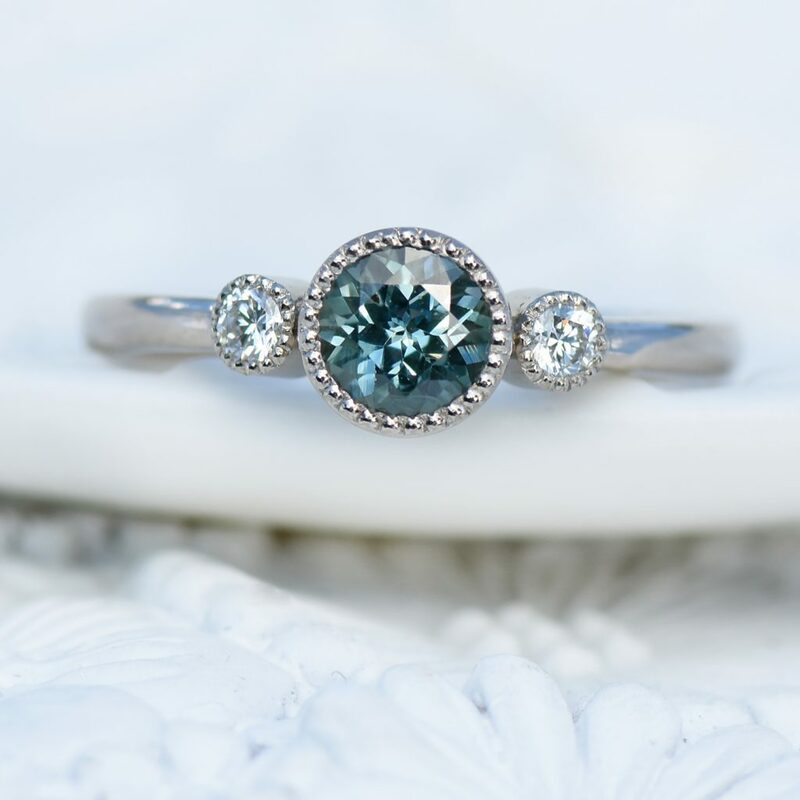 Precious gems like diamonds, sapphires and rubies can be used for the most decadent designs while similar stones like moissanite, blue topaz and garnets can be used to create less expensive alternatives. 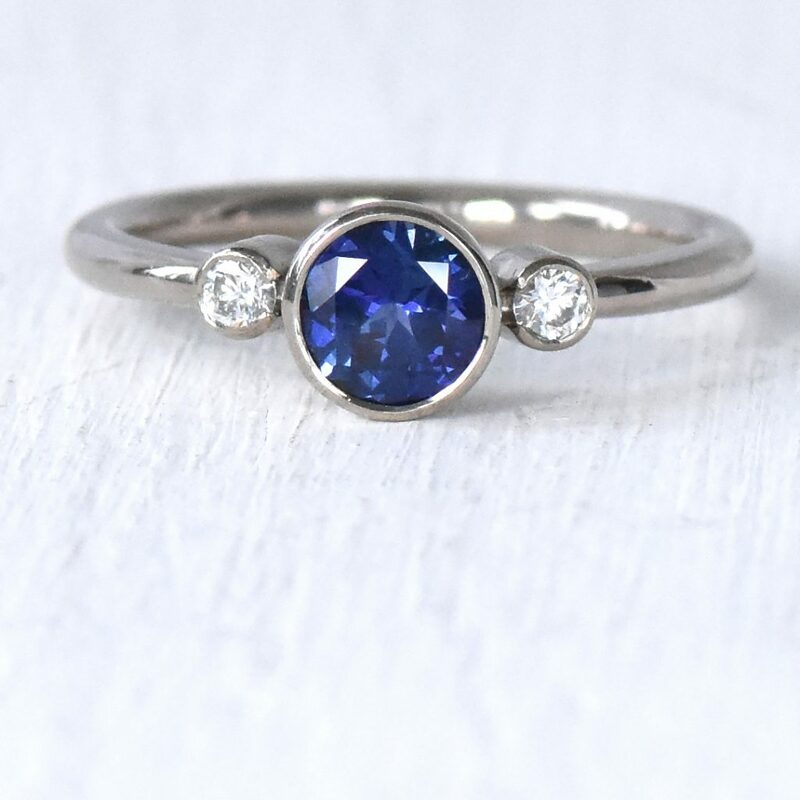 All of the gemstones in my jewellery are either natural, fair trade gemstones (including fair trade diamonds) or ethical lab-grown gems. I can source gemstones to fit your design ideas or you can choose from my current in-stock selection. 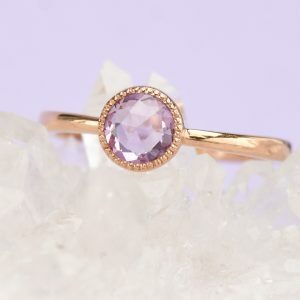 When it comes to choosing your gemstones, it helps if you know either the exact type of gemstones you want or a colour palette that I should work to. 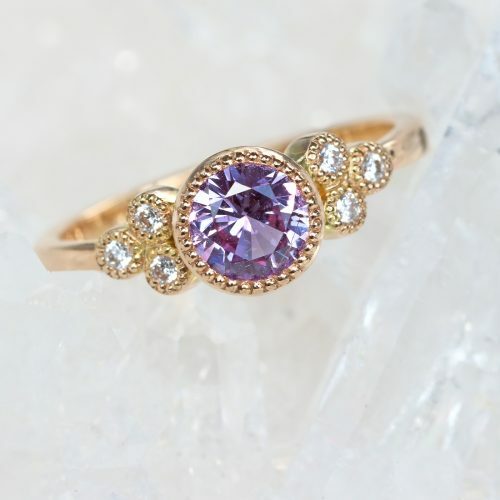 Many gemstones are highly similar to one another, so sometimes a purple sapphire might be a good alternative to amethyst. I'll let you know as many alternatives as possible so you can make the best choice for your design. 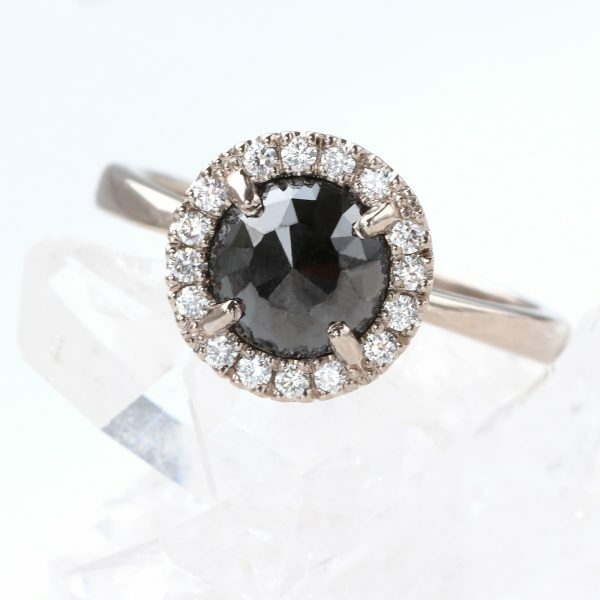 The below tips will help you choose gemstone setting styles for your custom made jewellery. 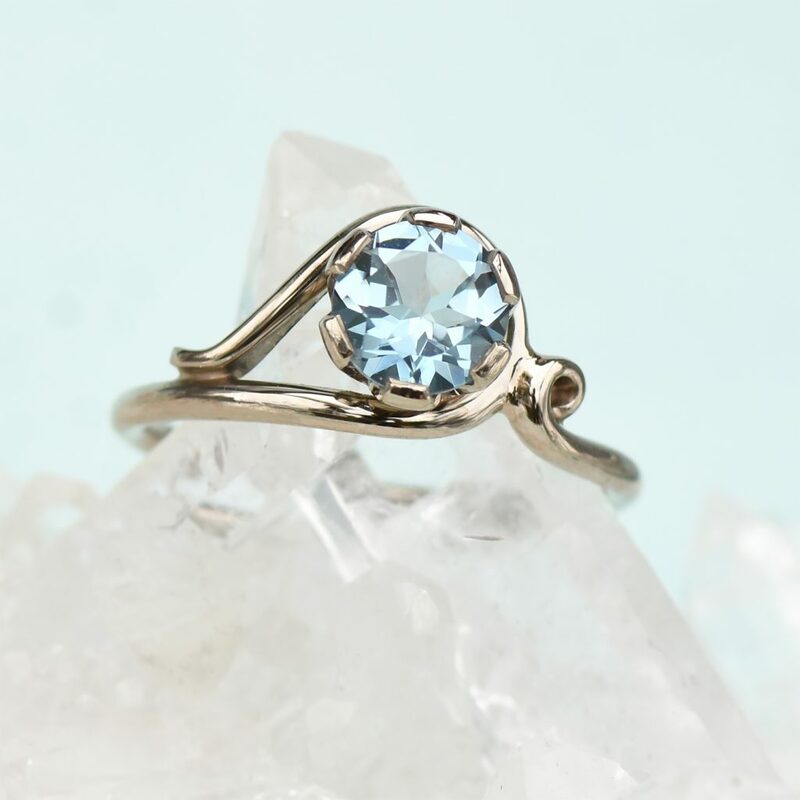 Clustered gemstone settings are crowded around the stone to create a sparkling frame that enhances the colour and sparkle of the middle setting. 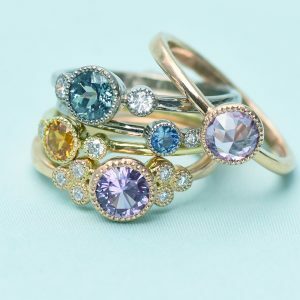 You can specify the number of clustered stones, the type of stones used and how far around the band of a ring they should cluster. 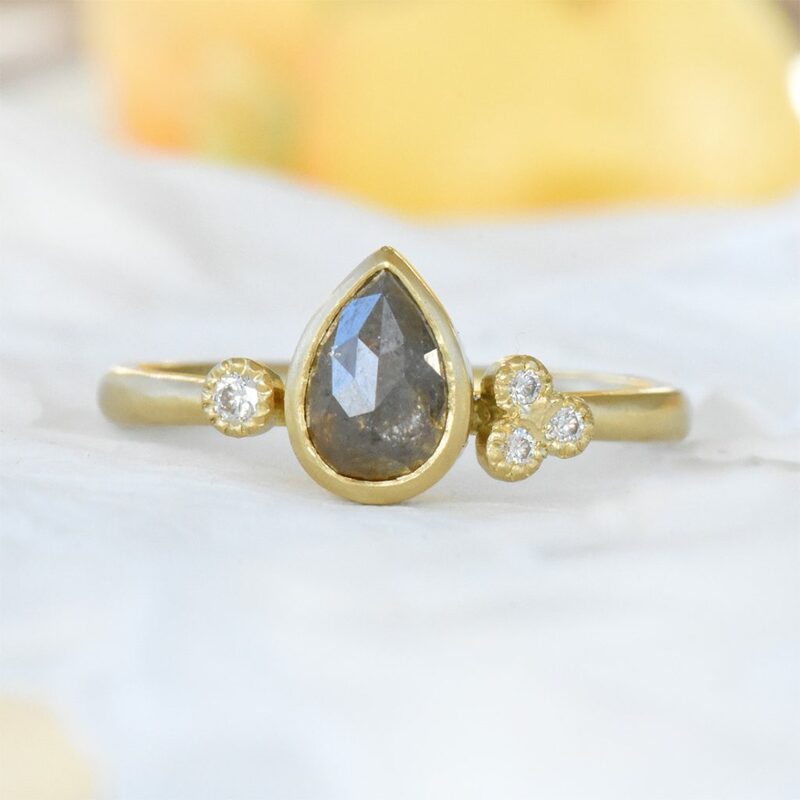 The detail in the gold around the gemstones is called 'millegrain edging', the ring could also be made with plain settings. This beautiful teal sapphire engagement ring features a central stone that is flanked by a diamond either side. Flanking stones sit on either side of the larger central stone, creating a trio of 3 perfectly aligned stones. You can add 2 or more flanking stones to a piece of jewellery. 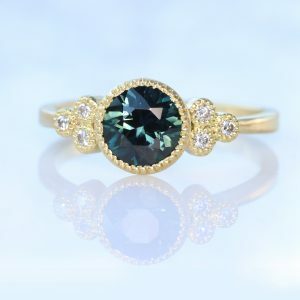 On this ring, the flanking stones would extend further around the ring band by adding further flanking gemstones to the outer settings. 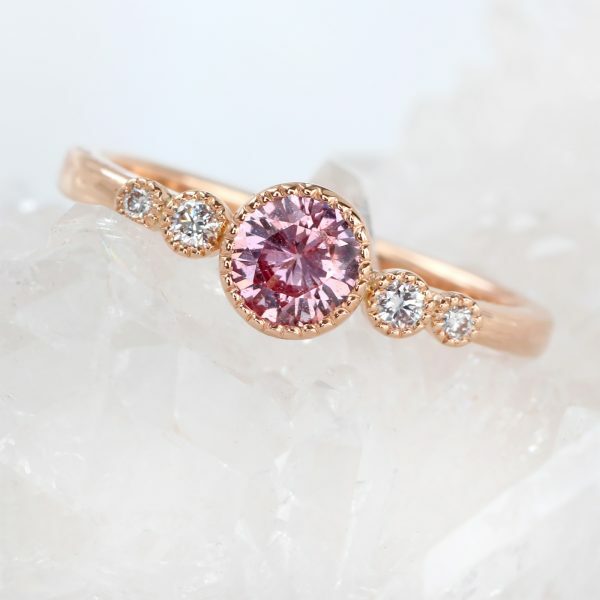 Gemstones can be set into jewellery in a variety of ways. 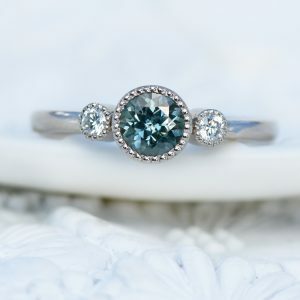 Rings have their own unique settings but there are other ways to add diamonds, sapphires and other sparkling gems into jewellery. Studding gemstones into the metal allows them to sit flush into the metal, so the stones protrude from the piece as little as possible. 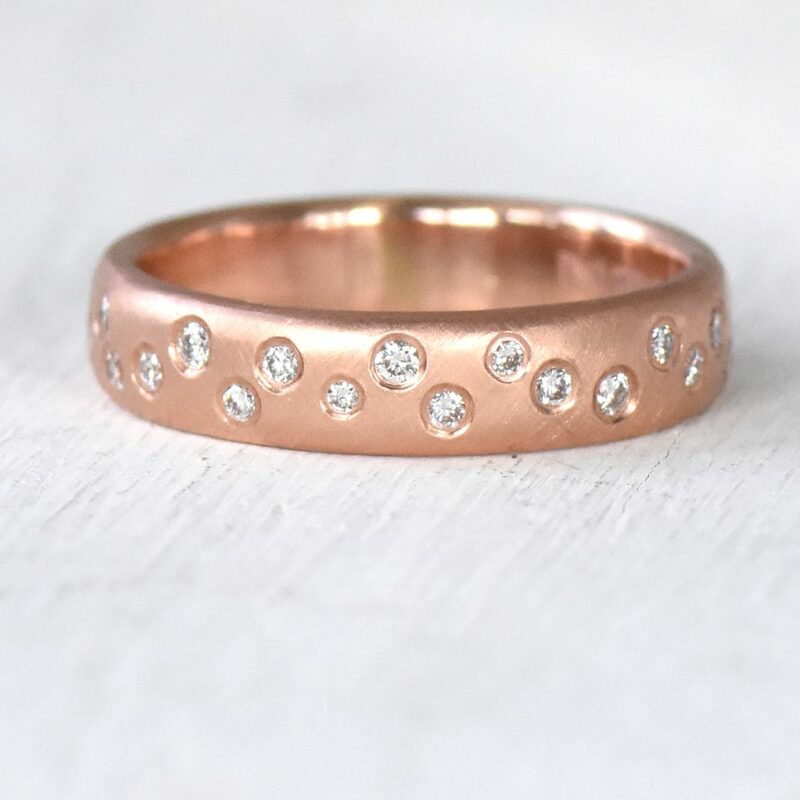 This technique is perfect for creating a diamond wedding band or other piece that will see a lot of wear. Pave jewellery is a delicate art form that requires a very steady hand and it can take days to complete the most elaborate pieces. Specialist tools are used to carve out a seat for the stone to sit in and to form the metal beads that hold the gemstone in place. 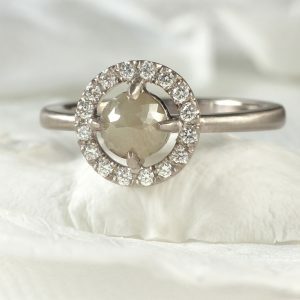 Gemstones can come in almost any shape and size, and they can be further changed with specialist treatments and cuts. 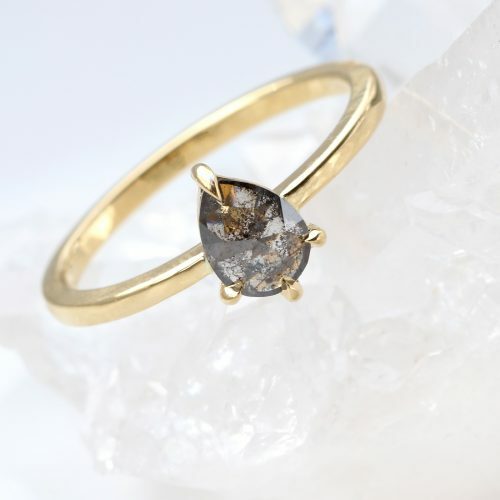 You can really get creative with your jewellery design by adding an unusual gemstone as the key focal point. 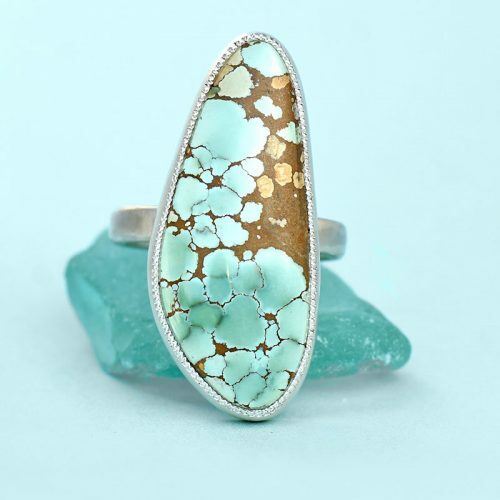 Natural, untreated turquoise and similar cabochons are some of my favourite gemstones to work with. Every stone is unique, with different veins and colours that will never be repeated in nature. Gemstones can also be cut in a variety of ways, changing the way they reflect light and giving them different types of sparkle. 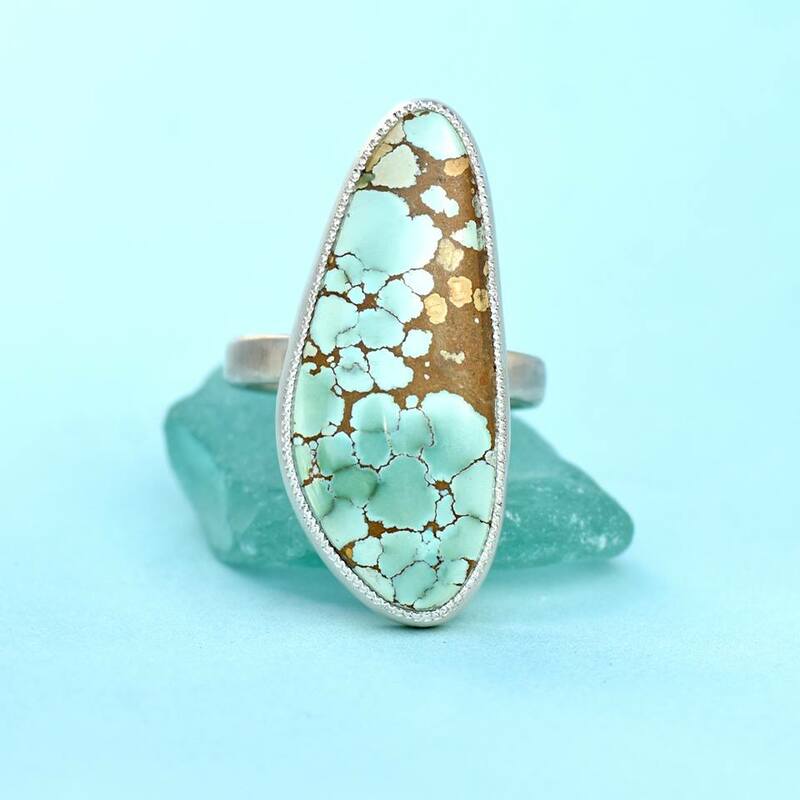 You can learn more about gemstone cuts in my Ring Guide. 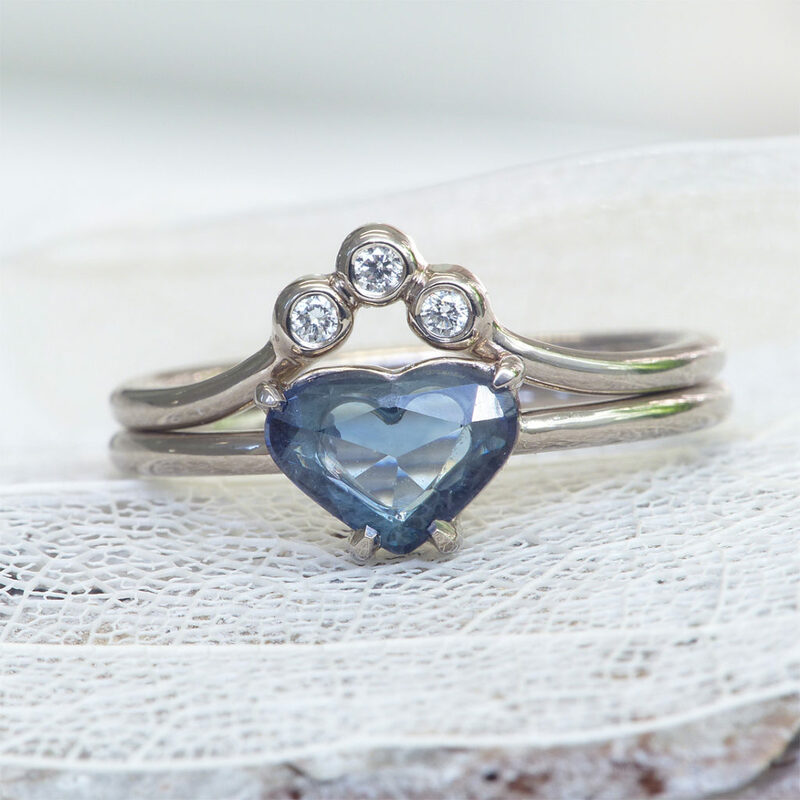 As well as different cuts, you can opt for a variety of shapes including hearts, diamonds, squares and pear shapes. 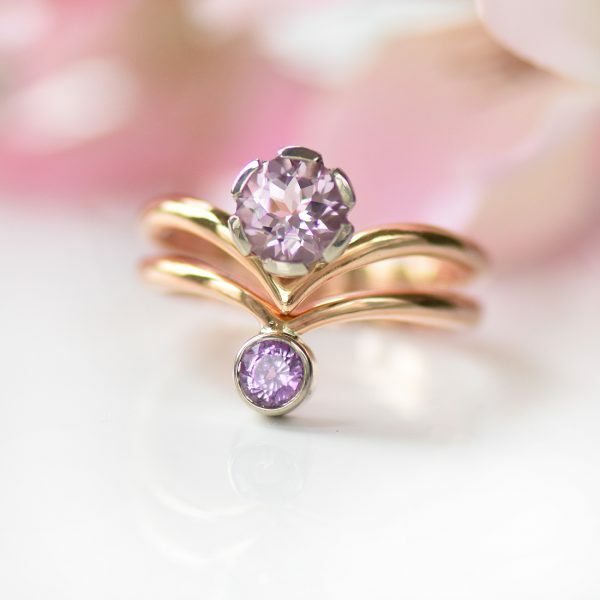 Ready to learn more about creating your dream jewellery design? Send Lilia some more details about what you'd like to create.